Austrian author and editor, and originator of The Jewish Encyclopedia; born in Weisskirchen, Moravia, Nov. 10, 1859; educated in the high schools of Ungarisch-Hradisch, Kremsier, and Troppau and at the universities of Vienna (Ph. D. 1884) and Berlin. In 1884 he founded the "Allgemeine Oesterreichische Literaturzeitung," which he edited and published in Vienna, discontinuing it on receiving the appointment of secretary and librarian to Count Alexandre Foucher de Careil, French ambassador at Vienna (1887). He accompanied the ambassador to Paris, and there became attached to the press bureau of the French Foreign Office. Later he founded and became editor-in-chief of "La Vraie Parole" (1893-94), a journal which was launched to counteract Edouard Drumont's anti-Semitic Sheet "La Libre Parole." 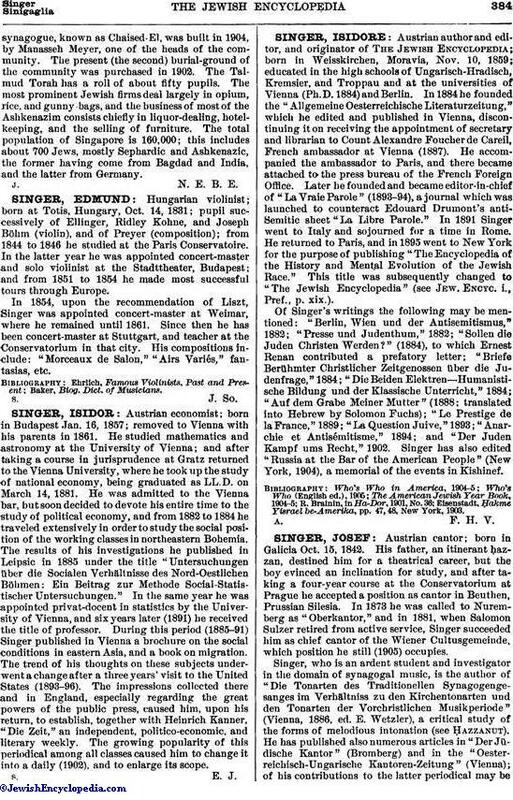 In 1891 Singer went to Italy and sojourned for a time in Rome. He returned to Paris, and in 1895 went to New York for the purpose of publishing "The Encyclopedia of the History and Mental Evolution of the Jewish Race." This title was subsequently changed to "The Jewish Encyclopedia" (see Jew. Encyc. i., Pref., p. xix.). Of Singer's writings the following may be mentioned: "Berlin, Wien und der Antisemitismus," 1882; "Presse und Judenthum," 1882); "Sollen die Juden Christen Werden?" (1884), to which Ernest Renan contributed a prefatory letter; "Briefe Berühmter Christlicher Zeitgenossen über die Judenfrage," 1884; "Die Beiden Elektren—Humanistische Bildung und der Klassische Unterricht," 1884; "Auf dem Grabe Meiner Mutter" (1888; translated into Hebrew by Solomon Fuchs); "Le Prestige de la France," 1889; "La Question Juive," 1893; "Anarchie et Antisémitisme," 1894; and "Der Juden Kampf ums Recht," 1902. Singer has also edited "Russia at the Bar of the American People" (New York, 1904), a memorial of the events in Kishinef. Eisenstadt, Ḥakme Yisrael be-Amerika, pp. 47, 48, New York, 1903.